These are the best scopes you can buy. Ideal for competition shooters, or those with bigger budgets. They offer the very best of everything available today. The choice amongst these scopes now comes down to nuances, personal choices and your shooting community. There are a wide variety of feature, reticle and service support options, and many of these scopes are made in North America, Germany or Japan, with the highest levels of quality assurance and durability testing. They also tend to have by far the best glass and internal components. 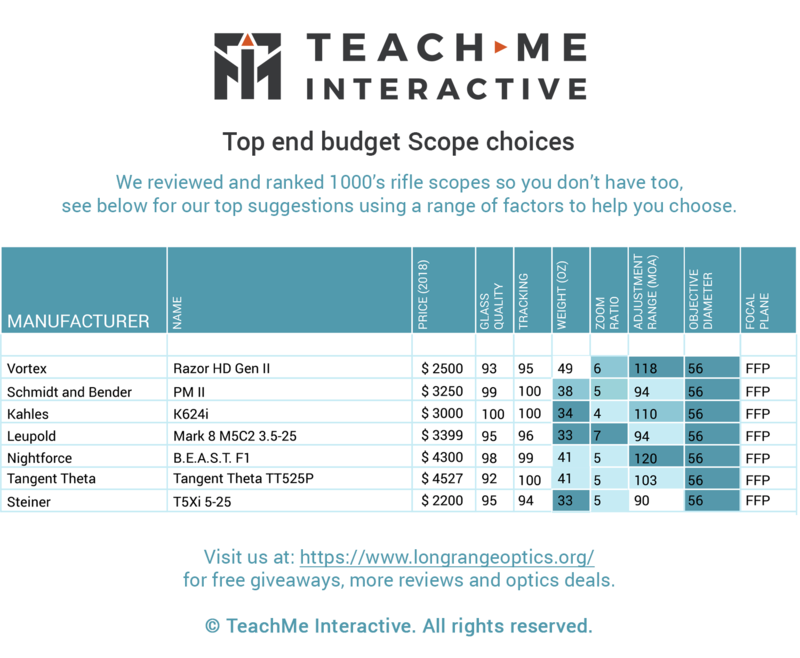 There are more great scopes in this category but these scopes are ones the team has chosen as the best all-around choices and value for money. Many of these scopes have multiple family variations, so again use this as a starting point for further exploration into the best scope for you. This is the top group of scopes and it’s very hard to pick the best scope as prices vary widely and most of them are superb scopes, and all are ideal for long range shooting. They have different features, and options, and warranties. The authors appreciate however that the Nightforce F1, Steiner, Leupold and Tangent Theta are built in North America! Vortex Razor HD Gen. II: Most popular PRS scopes for high-end competitors. Clear glass, great holdover reticle for timed stages. Zero stop and illuminated reticle. Large and locking turrets. Solid clicks and turret feel. Great reticle options and warranty. Made in Japan. S&B PM II: High end scope for military and competition use. Great features including locking turrets, illuminated reticle and zero stop. Losing favor vs other manufacturers and offers only a two year warranty. Lots of variants and good solid German products. Kahles K624i: Kahles now often comes in second place in PRS matches, with growing following in the PRS community. Superb glass and great tracking combined with lighter weight and good competition reticle design make it a great scope at a middle price point in this group. A newer model is coming in 2018, so it might be worth waiting. Part of the Swarovski group, made in Austria. Leupold Mark 8 M5C2 3.5-25: Leupold’s flagship military product. Amazing glass and offers the Tremor 3 reticle, illuminated, zero stop, locking turrets and revolution indicator. Mostly made in the USA. Nightforce B.E.A.S.T. F1: Nightforce’s Flagship product, every feature you could want. Cleverly designed to offer 0.2 MIL clicks with a fine adjustment as required for fast dialing of long distances, turret brake, zero stop and 20 MIL of elevation per rotation but that does lead to very large turrets some may dislike. 90%+ light transmission. Incredible internal adjustment, clear glass, lots of reticles including Tremor 3 reticle, the BEAST is a great scope if you can afford it. Made in the USA. Tangent Theta TT525P: The Tangent Theta is a great scope with a number of unique features (along with all the usual ones) like the tool-less turrets, double-turn elevation with tactile revolution indicator, locking diopter and superb glass but that quality comes at a price. Some of the best feeling turrets, smooth and lower profile with easy adjustment in the field. The overall feel of this scope is very high quality and it has a pleasing aesthetic too. Limited reticle designs might be the only downside. Made in Canada. Steiner T5Xi 5-25: Steiner makes great durable products, tactile “low profile” turrets, locking diopter, illumination with excellent glass at a reasonable price. In this group among the cheaper options, if it’s a choice between the Vortex and this scope, this one wins on its glass, weight and local manufacture but it is less popular in store and has fewer reticle options than the Vortex. Excellent warranty and service. Made in the USA/Germany. •	Huskemaw Tactical 5-30x56 ($2,500): Best known for their patented RFBC Turret System with HuntSmart Reticle when combined allow the shooter to save time and checking ballistics tables, the turrets for both elevation and windage are set up for your rifle so you can dial and shoot, great for hunting situations. The dual-interlocking turret reveals the second turret underneath for another load, environmental condition or second revolution, a unique way to carry several shooting solutions on the scope. SFP weighs against it. •	Sig Sauer Tango 6 5-30x 56mm ($2,500): Modern design, with very tactile if slightly mushy turrets, interesting finish and every feature you might want. Like Vortex, it makes its Tango 6 scopes in Japan, not Indonesia. Still new, so not enough community feedback yet. Feels and looks like a real contender. Made in Japan. •	EOTech Vudu 5-25x50 FFP ($2,200): EOTech is known for its holographic sights but this new sight is part of a developing range of new optics. The main standout feature of this scope is its length, it’s very short. That will be very useful for the Military and anyone that wants to attach night optics to the front of the scope on a rail. It has all the other features and glass of the rest and feels very solid and well made. Made in Japan. •	Leupold Mark 5 Riflescope 5-25x56 ($2,300): 35mm main tube and large objective lens should allow in more light, FFP, locking turrets and great glass - a good replacement for the venerable Mrk 4 perhaps? Well reviewed but not on the same plane as the Mark 8 glass. Mostly made in the USA. •	Nightforce ATACR™ 7-35×56 F1 ($3,500): The usual NF quality and durability with incredible magnification range. Also, it has parallax adjustment down to 10 meters and 100 MOA of elevation travel. For those with older eyes, the wide field of view paired with large zoom could be a big advantage. Made in the USA.